Now with available illumination, the UltimateSlam riflescope is the ideal combination of flexibility, accuracy, and durability for today's modern muzzleloaders and shotguns. The advanced SA.B.R. reticle provides precise and distinct hold points from 50 to 300 yards, accommodating sabots with 2-pellet, 3-pellet, 12-guage, and 20-gauge ballistics. A special range estimation feature instantly tells you if the trophy is closer or farther than 200 yards. The Leupold UltimateSlam 3-9x40 Rifle Scope brings a new degree of performance to a hunting rifle scope. With a host of new and improved features, these Leupold rifle scopes will give you superior performance in the field, along with the ruggedness and dependability you'd expect from a Leupold Golden Ring scope. 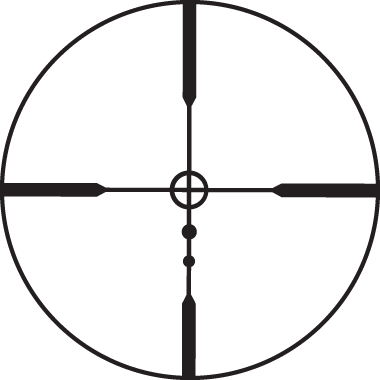 The Leupold UltimateSlam 3-9x SABR Reticle Riflescope features the SA.B.R. (SAbot Ballistics Reticle) to give you unparalleled accuracy when you're shooting with a sabot-equipped shotgun or muzzleloader. Leupold has equipped the Ultimate Slam with their new Quantum Optical System, which features lead-free, precision ground and polished lenses, coated with Multicoat 4 lens coatings, for excellent resolution, clarity, and contrast, even in low light conditions. The lens system of the Leupold Ultimate Slam 3-9x40mm Multi-Coat 4 Scope gives you reliably fast target acquisition in any light conditions, including the darkest, rainiest times of day, thanks to its stellar 92% light transmission rate. The Leupold Ultimate Slam 3-9x40mm Finger Adjustable Riflescope also sports improved mechanics, with finger-adjustable, 1/4-MOA click windage and elevation adjustments that allow you to make adjustment in the field with ease and improves zeroing speed. The power selector ring of the riflescope incorporates a tactile indicator, making it easy to adjust while wearing gloves and looking through the scope. A fast-focus eyepiece with a low-profile lock ring allows you to keep the reticle in focus even when you're adjusting powers. The Leupold UltimateSlam 3-9x Riflescope is waterproofed via oxygen purging; the scope is filled with nitrogen gas and sealed for decades of waterproof, shock-proof, and fog proof performance. For the ultimate in durability and optical precision, choose the Leupold Ultimate-Slam 3-9x40mm Waterproof Rifle Scope. Eye Relief: 4.2" to 3.7"